Hands-on learning and project-based learning have become buzz terms in the STEM education world. But MESA students have been using the math and science concepts they learn in the classroom to create engineering projects for decades. MESA Days — yearly hands-on engineering competitions — are a core piece of MESA’s 47 years of success. The competitions are grade-specific, continually updated and reinforce California State Board of Education math and science standards. MESA Days show students how what they learn in the classroom translates to real world engineering problems. Oh, and it’s a ton of fun. Students spend the good part of the school year designing, testing and competing in preliminary, regional and state competitions before the top middle and high school teams from California are named in May. Those state champs move on to the MESA National Engineering Design Competition in June. 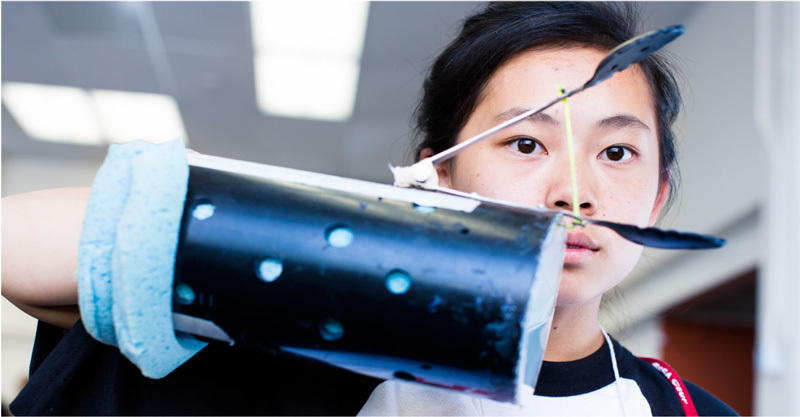 Teams of students create a prosthetic arm that will complete a series of tasks. This year’s challenge tasks students with designing and creating a prosthetic arm with a functioning “hand” powered by a circuit board. Student teams participate in the full R&D experience by preparing a technical paper and academic display, defending their process and product before a panel of professionals and compete with teams from the other ten MESA USA states in performance. The MESA National Engineering Design Competition will be held June 21-24, 2017 and hosted by Pennsylvania MESA at Temple University in Philadelphia.